Apparently, “boys will be boys” even in 1850. In preparation for a bang up 4th of July celebration in old Duxbury, a group of teenage boys were soliciting funds to purchase a keg of powder in Boston. The plan was to ship the keg to Duxbury and “make that cannon behind Swift’s Shop ring.” The price of the keg and shipping was $3.00 and any contribution, no matter how small, was welcome. The young man behind the scheme was Eugene Sampson (1833-1901), the nephew of one the wealthiest and most influential men in town, Hon. Seth Sprague. In 1849, at the age of 16, Eugene left his home in Duxbury to board at 31 Somerset Street in Boston. He was employed in the counting rooms of Sprague, Soule & Co (dealers in grindstones and plasters) located at No. 7 T Wharf. 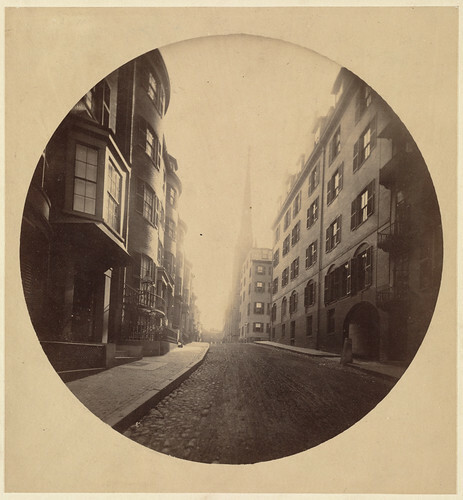 Somerset Street, Boston in 1860 from Boston Public Library’s collection. 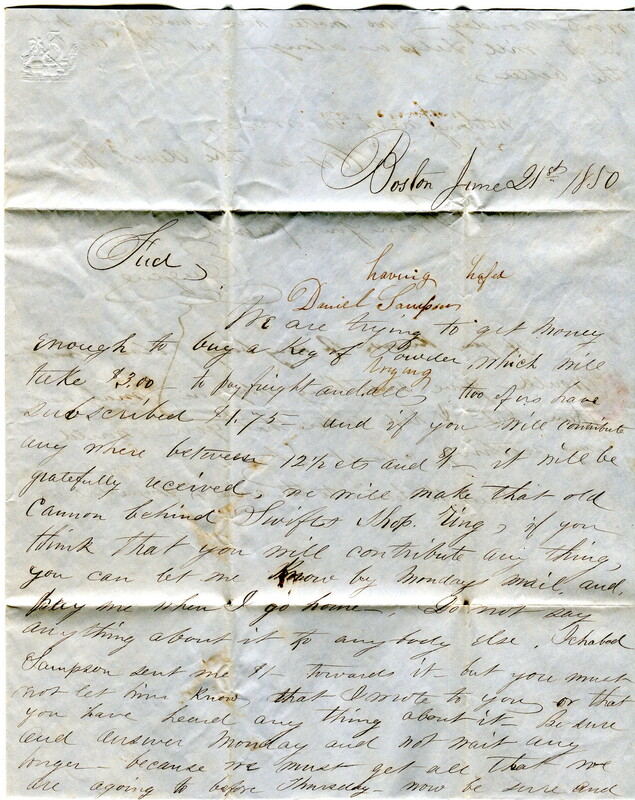 Eugene often wrote to his Duxbury cousin, Daniel Sampson (1832-1893), of his life in the city and inquire about friends at home – especially the girls. He also described all there was to see and do. The California gold rush was on and Boston was bustling with young men (many from Duxbury) heading west. Gene would typically get to bed at two o’clock in the morning and sleep until past breakfast. Eventually, Eugene slowed down and became a much more respectable member of Boston society. In 1857 he married Martha Gilbert of Dorchester. The couple had five daughters. Census records indicate he became the treasurer of a cotton mill. His cousin, Daniel, became a ship’s captain and married Ada Gifford of Boston. We are trying to get money enough to buy a keg of Powder which will take $3.00 to pay freight and all. Two of us have subscribed $1.75 and if you will contribute any where between 12 ½ cts and $1 it will be gratefully received, we will make that old cannon behind Swift’s shop ring. If you think that you will contribute any thing, you can let me know by Monday’s mail and pay me when I go home. Do not say any thing about it to anybody else. Ichabod Sampson sent me $1 towards it but you must not let him know that I wrote to you or that you have heard any thing about it. Be sure and answer Monday and not wait any longer because we must get all that we are going to before Thursday. Now be sure and write Monday no matter how small you put in it will help us along, the larger the better. If you know of any body else that would give anything why you may ask them, but I had rather you would say nothing about it. Direct the letter to the care of Sprague Soule. I would love to know what became of the keg of powder and the boys’ Fourth of July celebration. I am certain it went off without a hitch…I mean really, what could possibly go wrong?